Climate change projections have indicated that both the Mopani District, in Limpopo in the north east of South Africa, and the Namakwa District, in the Northern Cape in the north west of South Africa, will be subject to increasing temperatures and changing rainfall patterns. 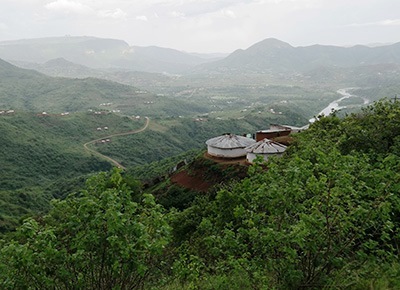 According to local scale analysis of historical trends and future projections, there is a distinct warming trend for both Mopani and Namakwa, which will be far more severe by 2050 if global mitigation efforts are unsuccessful. Rainfall changes are much less certain, with temporal and spatial variability. Yet in historical trends there are indications of an increase in the intensity of heavy rainfall events in both areas, evident through a decrease in the number of rain days coupled with an unchanged average annual rainfall. Warming, and the associated increase in the number of extremely warm days, is set to impact evaporation rates and water availability. This is a concern as water is already scarce in Namakwa and in parts of Mopani. Greater amplitude of dry and wet spells, along with increasing temperatures, will negatively impact already stressed communities in both areas – thus rendering them more vulnerable to the impacts of climate variability and change, more specifically droughts, seasonal shifts and storm-related disaster events. Climate-related risks are generally greater for disadvantaged, rural and poor communities because of limited adaptive capacity and greater sensitivity to climate-driven impacts. Both Mopani and Namakwa Districts are characterized by the prevalence of rural, poor communities vulnerable to the impacts of climate variability and change. This threat requires climate finance for adaptation activities to find its way to these most vulnerable communities. However, such communities typically lack the capacity required to access the necessary funding. The project thus entails the implementation of a small grant finance mechanism to address this financial, capacity and adaptation need. 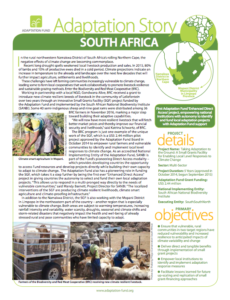 The Community Adaptation Small Grants Facility (SGF) will increase climate resilience in rural communities and socio-economic systems in these two pilot district municipalities in South Africa, by working directly with local stakeholders and anticipated beneficiaries through a small granting mechanism. The overall goal of the project is to ensure that vulnerable, rural communities in the project target areas have reduced vulnerability and increased resilience to the anticipated impacts of climate variability and change. The objective is to incorporate climate adaptation response strategies into local practices so that assets, livelihoods and ecosystem services are protected from climate-induced risks associated with expected droughts, seasonal shifts and storm-related disaster events. Compiling and sharing lessons learned to facilitate future scaling up and replication of small grant-financing approaches. The Community Adaptation SGF will be led by SouthSouthNorth (SSN) Trust, who will act as the Executing Entity (EE), and Conservation South Africa (CSA), who will act as the Facilitating Agency in the Namakwa District. The Facilitating Agency for the Mopani District is still to be selected.